In 711, the Berber landed at Gibraltar. By the end of their campaign most of the Iberian Peninsula (except for small areas in the north-west such as Asturias and the Basque) were brought under Islamic rule. The disintegration of the Caliphate saw Islamic control of Spain gradually eroded by the Spanish Reconquista (Reconquest) by which the Catholic Kingdoms of northern Spain eventually succeeded in re-conquering the Muslim states. This led to periodic warfare in Spain for almost 700 years (see Muslim Invasion of Spain). Moriscos (Spanish ‘Little Moors’) or Mouriscos (Portuguese) were Spanish Muslims who converted to Catholicism during the Reconquista and later was the sarcastic term for those thought to have outwardly converted while secretly continuing to practice Islam after the surrender of Granada in 1492. They followed Taqiyya, Arabic for caution,(alternate spellings taqiya, taqiyah, tuqyah), to conceal their religion while under threat, persecution, or compulsion. This gave a legality to an individual to deny his faith or commit illegal or blasphemous acts. The history of the Morisco community in Spain, from the conquest of Granada by the Catholic monarchs to their final expulsion, is one of the many episodes of xenophobia in our history. Other examples include Almanzors attacks on Jews and Christians and the expulsion of the Jews by the Catholic monarchs. The conditions for the surrender of Granada established very generous terms for the Muslims. They were allowed to keep their language, religion, customs, properties and authorities; eight years later, however, Cardinal Cisneros imposed the forced conversion of the Moriscos, as well as the elimination of their culture, the establishment of new onerous taxes and the curtailment of their administrative autonomy. The so-called ‘New Christians’ became increasingly exploited and reviled, while their previous rights were severely restricted. It is true that the Moriscos have risen up in rebellion, but it is the old Christians who have driven them to despair by their arrogance, larcenies, and the insolence with which they seize their women. Even the priests behave in a similar manner. When an entire Morisco village complained to the archbishop about their pastor, an investigation was made into the reasons for their complaint. Take him away from here the faithful pleaded.., or if not, let him be married, because all our children are born with the same blue eyes as his. However, the Christian side also committed atrocities. Massacres (the worst example of which took place in the village of Galera), the forced enslavement of the defeated Moriscos and extensive pillaging were common. For this reason we should give credence to events such as the deaths of more than a thousand women and children in the square at Juviles, and the sale of a similar number of both groups at public auction in Granada, as related in these chronicles. This butchery was carried out by soldiers and commanders who were not part of the regular forces, and whose sole aim seems to have been personal enrichment. The chronicles constantly give prominence to the efforts to win spoils and share them out, to ambition being the only strategy, and to desertion by men satisfied with the booty they had accumulated. Together with this, I have also tried in my novel to present an image of the conflicts and conditions within the rebel camp until the Moriscos, abandoned to their fate by Algiers and the Turks (as they had been before and would be again), were defeated by the professional Spanish soldiers. The taking of hashish to instil courage, the use of aconite as a poison on arrow tips, the arrogant attitude of the squad of janissaries sent from Algiers, the corsairs and the inclination some of them had for young boys: all this appears in the books of the chroniclers of the time. Also, in the work Mahoma by Juan Vernet, it is noted that according to Arab legend, several of the Prophet's swords reached al-Andalus, as I describe in my novel. The Alpujarra uprising ended with the deportation of the Moriscos of Granada to other kingdoms in Spain. In the case of those taken to Cordoba, like the protagonists of the novel, their exodus led to the death along the way of a seventh of those expelled, as seen from the study Los Moriscos en tierra de Cdrdoba by Juan Aranda Doncel. The defeat, the dispersal of the Moriscos, the discriminatory laws (which also had the result of rendering useless any attempts at assimilation) did not resolve the problem. There are many reports and opinions from the time which not only made this clear, but proposed terrifying ‘final solutions’. As a con­sequence, there were also many plots, all of which failed. Among the most serious was the one at Toga, which is recounted in the novel and which was thwarted as a result of the documents the King of England sent to the Spanish monarch following Elizabeth I’s death and the Anglo- Spanish treaty. In his book The Moriscos of Spain: Their Conversion and Expulsion, the historian Henry Charles Lea states that 'the 120,000 ducats the Morisco community promised to pay on that occasion to secure the support of the French King for the insurrection were in fact handed over in Fau'; while Dominguez Ortiz and Bernard Vincent, in their Historia de los Moriscos; vida y tragedia de una minoria, main­tain that this never in fact happened. However, the payment, or the offer to make it, does seem to be true. For plot purposes, I have decided the payment was made, and have fictitiously put this down to the profits made from counterfeiting money - a real economic scourge which occurred above all in the king­dom of Valencia, where in 1613 the municipal treasury was bankrupted, leading to the withdrawal of hundreds of thousands of fake ducat coins. The Moriscos were directly accused of this counterfeiting. Several Berbers were present at Toga, but the aid was not meant to come from Algiers or the Sublime Porte, but from Christians. The sufferings that the children went through - and here I am referring to the Morisco children, innocent victims of their people’s tragedy - merit an in-depth study. There is a wealth of references for this: first and foremost, there is proof of the slavery into which children under eleven were forced during the Alpujarra uprising, despite the royal edicts. From our view­point, it is also hard to consider all those over eleven as being adult. In second place, once the war had finished, there was the handover of the children of deported Moriscos to Christian families; there are documents that confirm legal processes in favour of these children who were trying to recover their free­dom once they reached the age of majority. Third, there was a fresh enslavement of children after the rebellions in the Valencian mountains (Vail de Laguar and Muela de Cortes). Finally, there exists documentation on those children aged under six who were kept in Spain when the definitive expulsion of the Moriscos took place. There are accounts that some families managed to send these children to France (the pro­hibition was on sending them to Barbary) and that others succeeded in getting round the royal decree by setting sail for Christian countries and then changing course at sea for the African coast. In the novel, several hundred of these children are said to have been detained in Seville. In Valencia, almost a thousand of them were handed over to the Church, and the viceroy’s wife used her servants to abduct an unknown number of them and looked after them to prevent them falling into the hands of Satan, as would have happened if they had gone to ‘Moorish lands’. Following their expulsion, the Moriscos from the village of Hornachos, an enclosed, warlike community, settled in and later took control of the corsair port of Sale, next to Rabat. In 1631 they negotiated with the King of Spain to hand over the town to him on several conditions, including that of the return of the children of whom they had been robbed. From kingdom to kingdom, village to village, there are many examples of com­munities where the youngest children were taken from the Moriscos. As far as the exact number of Moriscos expelled from Spain is concerned, the figures quoted vary so widely it would be really unhelpful to name those authors who suggest one or other figure. Perhaps, following Dominguez and Vincent, the closest we can come is their total of approximately three hundred thousand. Moreover, most of the authors who have studied the Moriscos (Janer, Lea, Dominguez and Vincent, Caro Baroja...) speak of the killings that took place when those deported reached Barbary. Some of them affirm that almost a third of the Moriscos expelled from Valencia were killed on arrival. In this they are following Philip III's chronicler, Luis Cabrera de Cordoba, in his Relaciones de las cosas sucedidas en la corte de Espana desde 1599 hasta 1614: ‘and they (the Moriscos) are so horrified at the mistreatment and harm that the people of Valencia have received in Barbary, since a third of those who left have died, that very few of them wish to go there.’ King Philip, however, celebrated the operation and gave a gift of a hundred thousand ducats in Morisco possessions to the Duke of Lerma on the occasion of the royal adviser's wedding to the Countess of Valencia. After the first expulsion, a series of edicts was issued that insisted on the deportation of any Moriscos who might have remained in Spain or returned there, permitting and even rewarding the murder or enslavement of anyone found. It should also be recognized that the expulsion edicts varied according to each kingdom, although basically these different orders varied only slightly. In the novel, I have used the first of these that was passed, in the kingdom of Valencia. Among the exceptions, the city of Cordoba is particularly interesting. On 29 January 1610 the city council petitioned the King for permission to allow two old, childless harness-makers to stay in the city ‘for the general good and for the sake of the riders’. I have no evidence to suggest that apart from these two old Moriscos, who were to carry on looking after the horses, there were any other exceptions; nor do I know what His Majesty’s reply was to the request. To this day, the Muslims of the world lament the loss of Andalus, the Arabic name for their Spanish Kingdom. While every Muslim knows what a mortal blow the loss of Spain was, few in the West are aware that even after the fall of Granada, the Spanish were not so easily rid of Islam. On January 2, 1492, the Islamic Kingdom of Granada was surrendered to the Catholic majesties of Ferdinand and Isabella. After 781 years, Spain was free. However the capitulation was negotiated. Ferdinand and Isabella did not want a bloodbath of a frontal assault on a fortified city, and so granted generous terms. Even in the midst of defeat and collapse, the Muslims insisted on maintaining some aspects of Islamic supremacy. One also wonders at the mindset of the Muslims that they could insist on such outrageous exemptions. One wonders why Ferdinand and Isabella agreed to these terms at all; or whether they ever had any intention of keeping them. Initially, the Spanish tried persuasion and debate to try and convert the remaining Moors. However, in 1499, the Spanish Archbishop [and later Cardinal] Cisneros took the more ruthless approach of forced conversions; and burned Arabic manuscripts. His brutal methods let to open revolt, which was quickly suppressed. The Spanish then considered the treaty of capitulation voided, and suspended freedom of religion. By 1500, Cisneros reported, "there is now no one in the city who is not a Christian, and all the mosques are churches." As later events would show, the remaining Moors in Spain would not surrender Islam so easily. These new Christians were called Moriscos [Moorish ones]; however their conversions were less than sincere. For the most part, conversion was nominal: the Moors paid lip-service to Christianity, but continued to practice Islam in secret. For example, after a child was baptized, he might be taken home and washed with hot water to annul the sacrament of baptism. The former Muslims were able to lead a double life with a clear conscience because certain Islamic religious authorities ruled that, under duress or threat to life, Muslims might apply the principle of taqiyyah . They continued to speak Arabic, and continued to wear Moorish clothes. In 1526, the King of Spain sought to suppress the Arabic Language and Moorish clothing; but the Moriscos paid a bribe of 80,000 ducados to have the law suspended for forty years, during which time they maintained their quasi-Islamic practices. In 1565, some Moriscos were caught trying to arrange a revolt which would seize the coast and call in the Ottoman Turkish navy for help. Phillip II decided to play tough. In 1566 the forty-year suspension of the Edict ran out. It was revised by a ‘Pragmatica’ -- even more severe as it required the Moriscos to learn Castilian within three years, after which no-one would be allowed to use Arabic. Moorish names were not to be used; Moorish garments were forbidden. And in 1567 Philip II issued a decree ending all toleration of Moorish culture. He banned the Arabic and Berber languages, prohibited Moorish dress, required Moriscos to adopt Christian names, ordered the destruction of all books and documents in Arabic script, and decreed that Morisco children would be educated only by Catholic priests. Open rebellion broke out across Granada. They abandoned their faux-Christianity. The war was savage with the burning of churches, the killing of Christian laymen and priests, and the taking of Christian hostages. Spain had to bring in outside help to crush the jihad. After the revolt, the rebels were dispersed throughout Spain in the hopes that they would assimilate. This would backfire. Though reduced to peasants, their numbers grew. Overall, they were 4% of the population, but in some provinces they could reach to 20%. Worse yet, their growth rate was substantially higher than the Christian population. Spain was fighting wars with Ottoman Turkey, England, and Protestants in Northern Europe, some of whom attempted an alliance with the Moors and the Turks against the Catholic Spain. This potential fifth column of secret Muslims terrified the Spanish. By 1609, Spain had had enough. Though some nobles suggested giving them more time to assimilate, it was obvious that after a hundred years most were not going to do so. Others among the aristocracy wanted them as a source of cheap labor; but again, their demographic threat was considerable. Phillip III declared that he wanted an expulsion of all the Moriscos left in Spain. This lead to another rebellion, also crushed. They were allowed to take only what they could carry; and they were forced to pay for their own passage. Upon landing in North Africa, some were attacked as invaders. From 1609 to 1614, almost the whole Morisco population was deported. Many to North Africa, some to France. Of 325,000 Moriscos, only 10,000 remained when the expulsions were over. No one denies that innocents were hurt in this forced expulsion. Some who had been sincerely converted to Catholicism were caught up in the dragnet; but neither can it be denied that, in general, the Moriscos were unassimilable, nor that they were a threat to Spain. WHAT WAS THE SIZE OF THE MORISCO POPULATION? There is much disagreement about the size of the Morisco population. The French demographer Henri Lapeyre estimated from census reports and embarkation lists that approximately 275,000 Spanish Moriscos emigrated in the years 1609-14, out of a total of 300,000. This conservative estimate is not consistent with many of the contemporary accounts that give a figure of 600,000. Bearing in mind that the total population of Spain at that time was only about seven and a half million, this must have constituted a serious deficit in terms of productive manpower and tax revenue. In the Kingdom of Valencia, which lost a third of its population, nearly half the villages were deserted in 1638. There is equal disagreement about the number of Moriscos who perished in armed rebellion or on the journey into exile. Pedro Aznar Cardona, whose treatise justifying the expulsion was published in 1612, stated that between October 1609 and July 1611 over 50,000 died resisting expulsion, while over 60,000 died during their passage abroad either by land or sea or at the hands of their co-religionists after disembarking on the North African coast. If these figures are correct, then more than one in six of the Moorish population perished in the space of two years. Henry Charles Lea, drawing on many contemporary sources, puts the mortality figure at between two-thirds and three-quarters. The demographic factor was one of the decisive arguments employed in favour of expulsion by Juan de Ribera in 1602. He warned Philip III that, unless he took swift action, Christian Spaniards would soon find themselves outnumbered by Muslims, as all Moriscos married and had large families, whereas a third or a quarter of all Christians remained celibate after taking holy orders or entering military service. The Moriscos, Ribera said, think only of reproducing and saving their skins, while their temperance in food and drink gives them a high life expectancy. Ribera’s fears were prompted by a census of the Valencian population that he himself had supervised that same year, which revealed that the Morisco population had increased by one-third. Miguel de Cervantes' writings, such as Don Quixote and Conversation of the Two Dogs, offered interesting views of Moriscos. In the first part of Don Quixote, which takes place before the expulsion of 1609-10, a Morisco translates a found document containing the Arabic history that Cervantes is described as "publishing." In the second part, after the expulsion, the character Ricote is a Morisco and a good mate of Sancho Panza. He cares more about money than religion, however, and thus leaves for Germany, returning later as a false Christian pilgrim with the purpose of recovering treasure that he has buried. He admits, however, that expulsion of the Moriscos is just. His daughter, María Félix, is brought to Berbery but suffers, since she is a sincere Christian. Morisco is sometimes applied to other historical crypto-Muslims, in places such as Norman Sicily, ninth century Crete, and other areas, along the medieval Christian-Muslim frontier. In the racial classification of colonial Spanish America, morisco was used for a certain combination of European and African ancestry, regardless of religion, similar to the classification mulatto. THE MORISCOS AND THE 21st CENTURY - ARE THE MUSLIMS UNASSIMILATABLE? From the times of the expulsion itself there was ample debate over its rightness and legitimacy – people who had received the sacrament of baptism were being expelled to North Africa, that is,to Muslim territory – and this debate was taken up by historians in the 19th century. The bibliography on the Moriscos makes up a very abundant department of studies, one which has made and continues to make rivers of ink flow, the “Morisco river” referred to by the book of Bernard Vincent. 2 The Morisco question is an emotive one and has a strong capacity for connecting with contemporary problems. It can be seen, to some extent, as a live issue which it is not always easy to approach in a purely historiographical way. In modern times, there hovers over Morisco history the presence of Muslims in Europe, who are the target of intense reactions. Some of these reactions and their formulations in the press today (whether Muslims can be Europeans or not, whether they are Muslims above all else, whether they are unassimilatable, whether they are going to alter fundamentally the societies in which they settle, whether their religious beliefs are compatible with our cultural and political values, whether they feel a “civilisational hatred” for Europeans, etc. ), although expressed in other terms, strikingly recall the discussions and emotions aroused in 16th-century Spain and settled with the expulsion of the early 17th century. Then as now, the discussion hinges, in reality, on the possibility or the desirability of assimilation. Is not assimilation, after all, an infiltration? The question, when all is said and done, is always the same: can they be us? The fundamental nature of this question is not changed by the fact that nowadays it is no longer good form to speak of assimilation, in the name of respect and of the freedom of different communities, or of a particular interpretation of the term “multiculturalism”. For frequently what is under discussion is the definition of our own identity and its construction; a question that is complex, sensitive and in perpetual evolution. Historical writing and the output of social sciences centred on the question of preserving identity are less given to studying the reverse question, i.e. the achievement of anonymity, of a total or partial non-differentiation that permits the disappearance (and therefore near-invisibility) in their surrounding society of hundreds of thousands of Moriscos, convert Jews... and European Muslims. Chejne, Anwar G. Islam and the West: The Moriscos, a Cultural and Social History. Albany: State University of New York Press, 1983. ISBN 0873956036. Ehlers, Benjamin. Between Christians and Moriscos: Juan De Ribera and Religious Reform in Valencia, 1568-1614. Baltimore: Johns Hopkins University Press, 2006. ISBN 9780801883224. Harvey, L. P. Muslims in Spain, 1500 to 1614. Chicago: University of Chicago Press, 2005. ISBN 9780226319636. Moriscos (Spanish "Little Moors") or Mouriscos (Portuguese) were Spanish Muslims who converted to Catholicism during the Reconquista and later the sarcastic term for those thought to have outwardly converted while secretly practising Islam. It also followed Taqiyya, Arabic for caution, whose adherents concealed their religion when under threat, persecution, or compulsion. This was a legal dispensation for a believing individual to deny their faith or commit otherwise illegal or blasphemous acts while under those risks. 1492 saw the capture of Granada, the last Muslim territory in Spain, so achieving the objective of Spain becoming a Catholic only country. Hundreds of thousands of Muslims were granted generous surrender terms as Spain did not want the bloodbath of a frontal assault on a fortified city. Muslims remaining in Spain were given religious freedom and exempted from all taxes for a number of years. In 1499, the Spanish Archbishop (later Cardinal) Cisneros led the ruthless policy of forced conversions and burning Arabic manuscripts. This led to an open revolt which was quickly suppressed. The Spanish then considered the treaty of capitulation voided, and suspended freedom of religion. Muslims who stayed were baptised Christians so Spain became a Christian only country. These New Christians were called Moriscos (Moorish ones). In practice they were secret Muslims (equivalent to the Jewish Marranos). The Spaniards saw their role of ensuring they were genuine Christians. In 1565, Phillip II added restrictions when Moriscos were found to be organising a revolt. 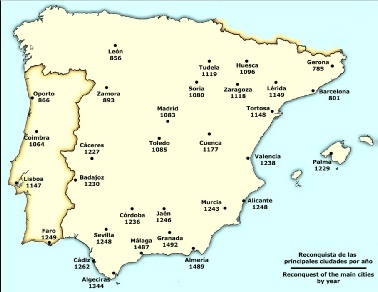 In 1566 there was a major rebellion which was put down and led to their dispersal in Spain. This potential fifth column of secret Muslims terrified the Spanish. From 1609 to 1614, almost the whole Morisco population was deported to North Africa and France. They then almost vanished from history on being reunited with others having a similar background. Of the estimated 325,000 Moriscos, only 10,000 remained.